Basava International School | Dwarka New Delhi : Top School in Dwarka. Nursery admission 2019-20 Draw of lottery will be held on 31 January 2019 at 3 PM in school permises. Set up by the KLE Society of Karnataka, the school recognizes the need for quality education for the over all growth of children to face a competitive world. KLE Society runs about 290 educational institutions including well known-medical and engineering colleges around the country. This is one of the largest networks of institutions for higher studies and technical education in India. KLE will complete 100 years of its service in 2014. 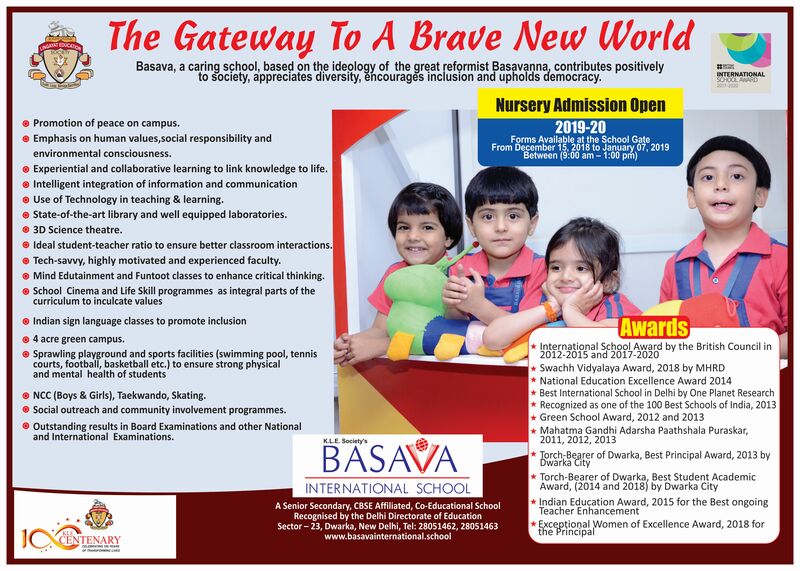 At Basava International School we have a clear idea about our role in the children's journey into the future. We want our students to boldly meet the challenges of a brave new world imbibing the values of a 5000-year-old civilization. That has been the Indian experience so far. We do not want our students to be merely successful but tell them to make an impact. Life skill programmes have been integrated into the school curriculum. Children at Basava learn to take life in their stride. The school promotes workshops to ensure that each child is bold and is embeded or empowered with fantastic success traits. School offers a wide range of educational & sports facilities. Principal : 9 :00 am to 11 :00 am, Teachers : Anytime within school hours. GM : Anytime in school hours. Our students study and develop in a pollution & stress free environment.